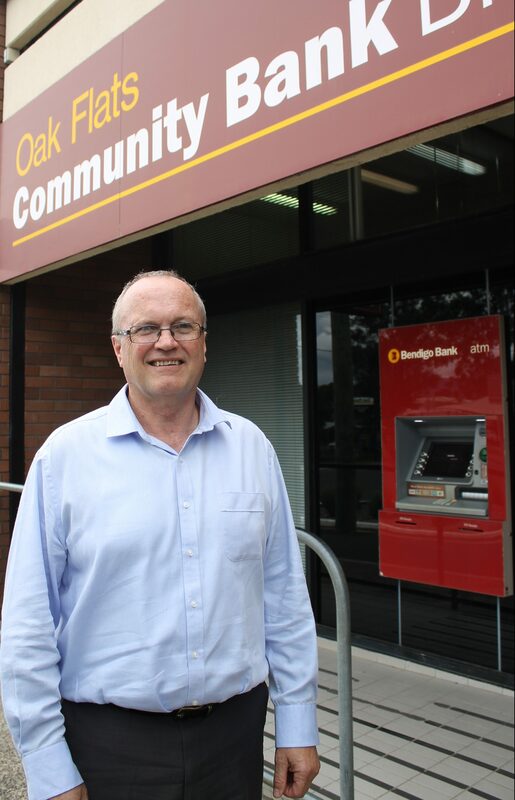 The Chair of Bendigo Bank’s Oak Flats Community Bank, Geoff Egan, says that the decision to make Gerringong a sub-branch of the Oak Flats operation is the best way to get banking services back to the village. “Using Oak Flats’ existing structure will streamline the whole process, as there are less hurdles to jump over,” he says. The hardest of these is the stipulation that a new branch has to generate $20 million in business on the books before it can open. of capital investment being made in record time and amount. “People keep saying ‘build it and we will come’, but that wasn’t possible when the standalone branch was being persued. “If the Steering Committee kept going with the idea of opening a standalone branch, it probably wouldn’t happen for another year. Having got in principle agreement for the sub-branch to be located in the current Library premises in Gerringong Town Hall, Mr Egan is waiting to hear whether the timeframe for getting into the space suits the bank. “We really just need to get some confirmed dates and lock it in,” he says. Once a space is available, a Bendigo Bank fitout typically takes 18 weeks. To open Gerringong as a sub-branch, Bendigo Bank has imposed two stipulations: that two locals be appointed to the Oak Flats board (Sandra McCarthy and David Banks have been nominated by the Gerringong Steering Committee) and that Oak Flats has a capital raising, targeted at the Gerringong area, to raise $400,000 to $500,000. Mr Egan says that the opening of the sub-branch can happen before the capital raising, again speeding up the process of having banking services return to Gerringong. Other benefits include taking advantage of economies of scale and being able to leverage off the experience of existing staff. The new structure will still mean that up to 80 per cent of the profits generated by the sub-branch will be donated back into community projects. Last year, the Oak Flats and Shellharbour branches donated $300,000 to local causes. By the end of this financial year, over the 19 years it has been established, $3 million has been given back to local causes. It is envisaged that initially the sub-branch will be open two to three days a week, with this expanding as the business grows.